Bobble. Leaving the last loop of each dc on hook, work 5dc in next sc, yo and draw through all 6 loops. Leaving the last loop of each dc on hook, work 1dc in each of next 2dc, yo and draw through all 3 loops. With 6.00mm hook and color 1 ch80, sl st to first ch to form a ring. 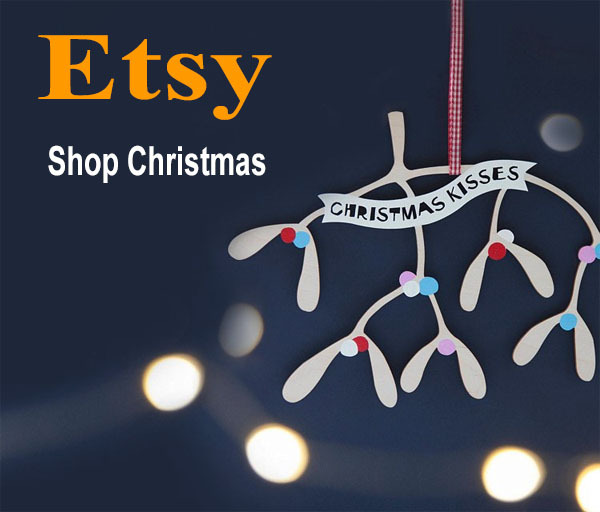 Row Two to Twelve – 3ch, 1dc in each dc to end, sl st to top of 3ch on beginning of row. Turn. Row Thirteen – (Dec) 3ch, 1dc in next dc, * dec 1dc over next 2dc, (see abbrev) 1dc in each of next 2dc, * rpt from * to * to last 2dc, dec 1dc over next 2dc, sl st to top of 3ch on beginning of row. Turn. Row Fifteen – (Dec) 3ch, 1dc in each of next 7dc, * dec 1dc over next 2dc, 1dc in each of next 8dc, * rpt from * to * to last 2dc, dec 1dc over last 2dc, sl st to top of 3ch on beginning of row. Turn. Row Seventeen – (Dec) 3ch, 1dc in each of next 6dc, * dec 1dc over next 2dc, 1dc in each of next 7dc, * rpt from * to * to last 2dc, dec 1dc over next 2dc, sl st to top of 3ch on beginning of row. Turn. Row Nineteen – (Dec) 3ch, 1dc in each of next 3dc, * dec 1dc over next 2dc, 1dc in each of next 5dc, * rpt from * to * to last 2dc, dec 1dc over next 2dc, sl st to top of 3ch on beginning of row. Turn. Row Twenty one – (Dec) 3ch, 1dc in each of next 3dc, * dec 1dc over next 2dc, 1dc in each of next 5dc, * rpt from * to * to last 2dc, dec 1dc over next 2dc, sl st to top of 3ch on beginning of row. Turn. Row Twenty Three – (Dec) 3ch, 1dc in each of next 2dc, * dec 1dc over next 2dc, 1dc in each of next 3dc, * rpt from * to * to last 2dc, dec 1dc over next 2dc, sl st to top of 3ch on beginning of row. Turn. Row Twenty Five – (Dec) 3ch, 1dc in next dc, * dec 1dc over next 2dc, 1dc in each of next 2dc, * rpt from * to * to last 2dc, dec 1dc over next 2dc, sl st to top of 3ch on beginning of row. Turn. 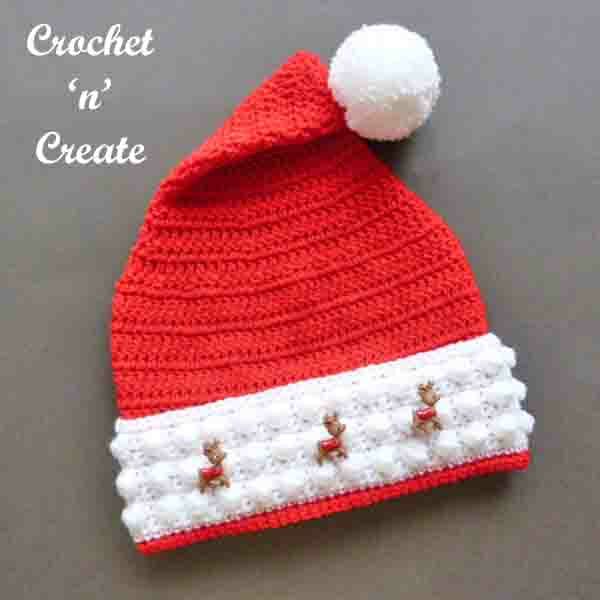 Row Twenty Seven – (Dec) 3ch, * dec 1dc over next 2dc, 1dc in next dc * rpt from * to * to last 2dc, dec 1dc over next 2dc, sl st to top of 3ch on beginning of row. Turn. 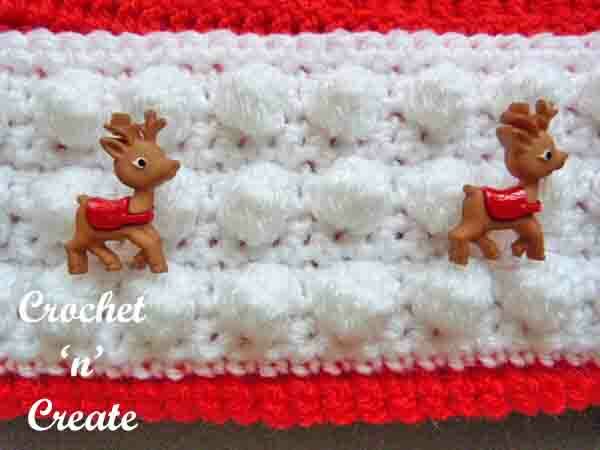 2nd Row – Work in the back loop of stitch only for this row. Using color 2 yarn, ch1, 1sc in base of 1ch, 1sc in each sc to end, sl st to first sc on beginning of row. Turn. 3rd & 4th Rows – 1ch, 1sc in base of 1ch, 1sc in each sc to end, sl st to first sc on beginning of row. Turn. 7th & 8th Rows – 1ch, 1sc in base of 1ch, 1sc in each sc to end, sl st to first sc. Turn. 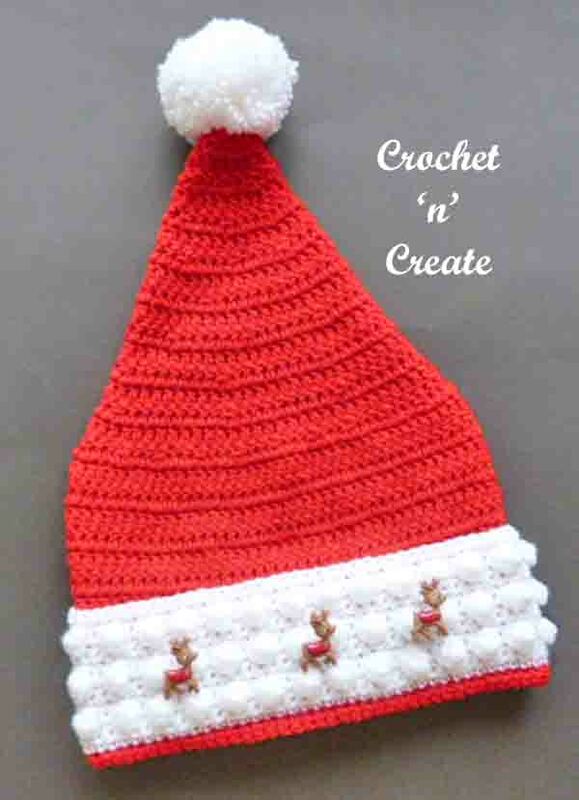 9th Row – 1ch, 1sc in base of 1ch, 1sc in next sc, * make a bobble in next sc, 1sc in each of next 2sc * rpt from * to * to last sc, make a bobble in sc, sl st to first sc on beginning of row. 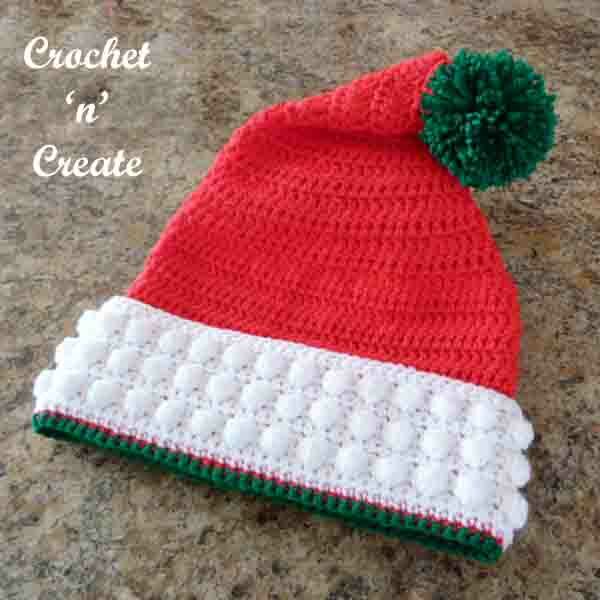 Using Clover pom-pom maker No 65 and color 2 make a pom-pom and attach to the top of the hat. 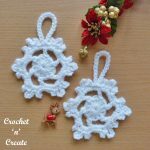 You can use a third color if you wish for pom-pom and Rim. 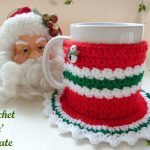 The written instructions and pictures for this christmas santa hat free crochet pattern are copyrighted to crochet ‘n’ create © 2018. 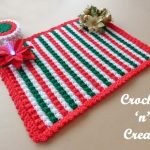 You are welcome to sell the finished crochet products made from the christmas santa hat free crochet pattern, I just ask that you please use your own pictures and put a link back to crochet ‘n’ create. 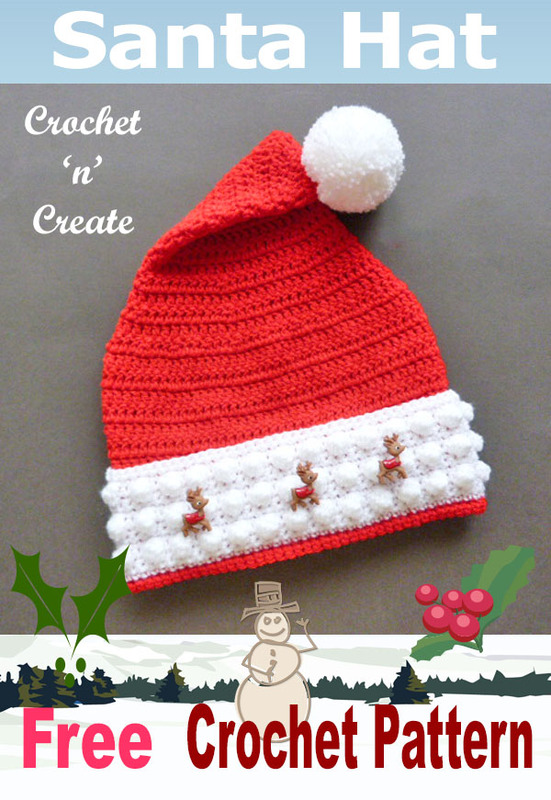 DO NOT share the written instructions for this christmas santa hat free crochet pattern.